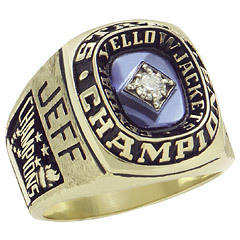 The 10kt yellow gold Endurance championship ring features a 12mm x 10mm simulated stone. Solid back ring is handcrafted in the USA by Gold Lance. Personalize it with your choice of favorite activity, school mascot, name and graduation year. This design is available with year date with diamonds. Please note, 25 ring minimum order is required.